A proposed rifle emoji initially set for release as part of Unicode 9.0 was removed from consideration after Unicode Consortium delegates representing Apple and Microsoft expressed disapproval of its inclusion, a report said Friday. 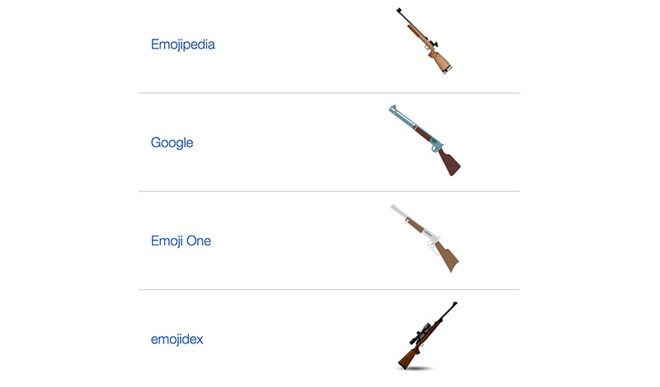 While the decision to nix a rifle emoji from the upcoming standard was unanimous, sources who attended Unicode's quarterly May meeting said Apple led the charge to quash its inclusion, reports BuzzFeed News. Rifle emoji variants had already moved through the encoding process on their way to release this month, but Apple said it would not support their inclusion. Microsoft seconded Apple's contention. Apple is not the first to take issue with the now dead firearm emoji. A UK gun control lobby protested the same issue after Unicode 9.0 candidates were announced last year, saying the inclusion of a rifle glyph is tantamount to familiarizing users with a weapon through an international standard. In response, Unicode President Mark Davis said the emoji was designed as part of a pack of Olympic sport graphics. Interestingly, another Olympic emoji illustrating the modern pentathlon, which incorporates pistol shooting as a sanctioned event, was also removed from consideration. As AppleInsider reported last week, the rifle character was original set to debut in Unicode 9.0 on June 21 when the standard officially launches on June 21. As it stands, the rifle and modern pentathlon assets will be included in Unicode 9.0 as characters without corresponding emoji representations. In other words, Unicode is adding a monochrome rifle symbol to its database, but will not incorporate a glyph into the dataset used to create emoji keyboards.